In Odisha, there are variations of Rasagola and the popular among them are Salepur Rasagola and Pahala Rasagola. #1. Rasagola was originated centuries ago in Jagannatha temple, Puri, Odisha. Rasagola is another delicacy from Odisha where Odisha is forgotten! But like many other important aspects of Odisha being centered around Jagannatha in Odisha, Rasagola was first born in the Jagannatha temple, Puri. The exact year when Rasagola took birth as “Khiramohana” in the “Rosaghara” (grand kitchen in Jagannatha temple, Puri that is also world’s largest kitchen) has never been documented. But the custom of Jagannatha offering Rasagola to wife after coming back from Mausima temple on the day of Niladri Bije takes us back to over 600 years. Sweet tradition! So, it is not Bengal, but Odisha that is birthplace of this popular delicacy. #2. The original name of Rasagola is Khiramohana. In the Odishan historical city of Puri, Rasagola is still known as Khiramohana. Khiramohana is brownish, mostly because of it being made of “chena” (cottage cheese) only and being boiled in “raseni” (sugar syrup, also called “sira”) for long. Khiramohana-Rasagola is less porous and less spongy as compared to the white Rasgulla. #3. The white Rasagola was first made in Nabin Das’s kitchen in 1869. When Odisha was struggling to exist after being devastated several times, by both natural disasters and foreign invader, many Odia people migrated to their closest relative West Bengal. Chefs, mostly from the Baleswara and Bhadrak district of Odisha, started recreating the Odia-aroma in the “Bangalibadi” (kitchen of the Bengalis). No wonder why many Bengali dishes match with that of the Odia. With the Odias, traveled their culinary skill and Khiramohana-Rasagola also made its way to Bengal. Nabin Das, a confectioner in Kolkata, while experimenting with the original Rasagola recipe added one portion of semolina to four portion of “chhana” (Bengali for cottage cheese). The Rasagola became more spongy and rubbery. That was when the white “Roshogolla”, as Bengalis fondly call it, reincarnated. His son K C Das further popularized it. Over time white version of Rasagola became popular worldwide as a Bengali delicacy. A brown Rasagola of the same volume and size of a white Rasagola would be heavier than the white one as the latter is more porous and rubbery. #4. Rasagola is making its way to the ISRO space misson! For its planned manned mission in 2016, Indian Space Research Organisation (ISRO) is exploring ways of producing dehydrated Rasagola so the astronauts would not miss home up in the space. #5. Rasagala is also the precursor of many other eastern Indian delicacies. Rasagola itself is a range of delicacies. In Odisha, there are variations of Rasagola and the popular among them are Salepur Rasagola and Pahala Rasagola. Salepur in Cuttack district and Pahala in between Bhubaneswar and Cuttack along side the National Highway 5 are quite known in Odisha and India for the Rasagola that they make. Bikali Kar from Salepur made the local variation popular and has even taken it to the level of starting an institution to teach about Rasagola and many other Odia cooking. Chhena Jhili, Rasmalai, Chhena Gaja, Raskadam, Chamcham, Pantua, Malai Chop and Kheersagar are some of the other sweet delicacies of the orient that are more or less derivatives of Rasagola. #6. 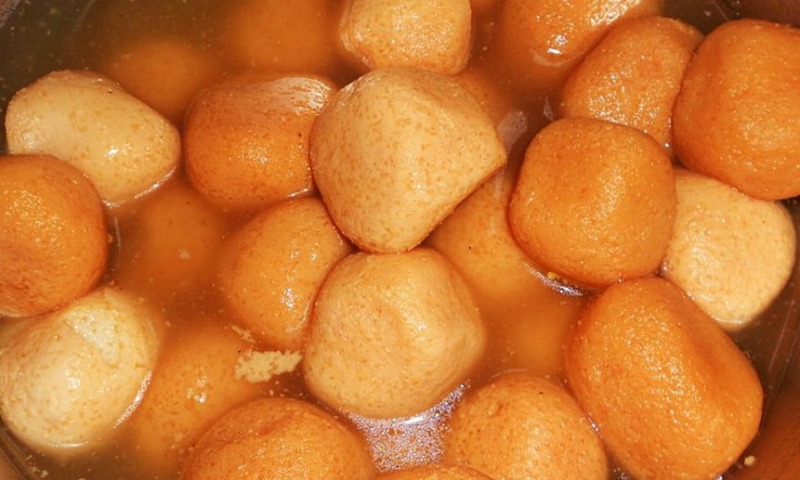 30 July 2015: Rasagola has a day for itself! By many Odia people on the social media it was decided to build a campaign around Rasagola and it shaped to a movement, and “Rasagola Dibasa” (Rasagola Day) is being celebrated today worldwide. In two hours of time Twitter users have tweeted over 1500 times with the hashtag #RasagolaDibasa and managed create 95,230 impressions reaching out to 22,430 Twitter users. Many are actively posting with the same hashtag in Facebook, Instagram and blogs. The most popular Odia daily carried a special Sunday weekly edition on 26 July featuring Rasagola and started a campaign for Rasagola Dibasa by partnering with the Rasagola vendors of Pahala. #7. Rich Rasagola, a big no for diabetics! Rasagola, being such a fondly delicacy among many is a big no for diabetics. A 100g Rassagola has 186 calories with carbohydrates comprising 153 calories, fats for 17 calories and proteins for the remaining 16 calories. According to to nutrition portal Livestrong.com, “a serving of rasgulla provides about 9 percent of the total daily calorie requirement for a standard diet of 2,000 calories”. That still doesn’t stop the Rasagola lovers to compromise with their love. #8. Woes lovers over in four nations in the subcontinent and all over the world. Rasagola is lovingly and largely sold in four South Asian nations; India, Bangladesh, Pakistan and Nepal. The Nepalese call it “Rasbari” while gulping with love. Rasagola is also sold in canned tins outside the subcontinent in many South Asian grocery stores. The brown Tasagolas from Odisha are gaining more and more popularity in Indian cities like Bengaluru, Mumbai and Delhi, thanks to the restaurant chains like Dalma, and the Odisha government run Odisha Bhavan. Global Voices (GV) author, special interest in Rising Voices author, GV Odia translator coordinator, educator and open source evangelist from Odisha and based in Bengaluru, India. Mozillian, long time Wikimedian, OpenGLAM Working group member and ambassador for India and currently at the Centre for Internet and Society‘s Access To Knowledge program. Works on building partnership with GLAM institutions, universities, language research organizations, government departments and individuals for bringing more scholarly and encyclopedic content on language, culture and history under free licenses. Learning interests in building low cost models for academic education programs. Voiced in many language related conferences, policy and implementation discourses around open knowledge and open source. The write-up could have been better, nevertheless the fact that rasagola was actually khiramohana which dates back long back and much before bengalis advertised it as “rosogolla”. But the history of this sweet, the origin is ofcourse from Odisha. Indians and the world knows bengalis are too good at advertising, may be we should also learn. Fighting the truth has no meaning just because lies are sweeter. The vast military force, wealth and power were the main cause for the Magadha empire to want Kalinga. King of kaliga did not surrender and the “so called” Kalinga had defeated the Magadha empire which was feared by rest of India many times before. It is the bloodiest war in the history of wars in India, even the women of Kalinga had fought, the tales of bravery still goes on till date. Our king did not surrender to any king or britishers unlike our neibours. The “so called” Kalinga empire bravery and tragedy of war changed Ashoka’s mind. It is lone war which brought a change of heart, prompted a invader towards non-violence. Every language is different, saying one is sweet and the other is not is not acceptable. Odia is one of the few classical language so it can’t be compared to folk languages. Infact there’s so much less drama, clear to the ears just like the odia people. About the CM, he us far from being the best and the reason is definitely not the language. We elect CM to work for the people not entertain us with words sweet to the ears. ”This is the saddest piece of writing ever seen on the Indian gastronomic and cultural front. just changing the name from roshogolla to rasagulla won’t make it Intellectual property of Oriyas. This article is very well written. It is well evident from your words that certain facts mentioned are not being digested by you. You should better remember the history as it is and not distort as some imbecile bongs preach around.